Here is a special poem that our friend Rae gave us to circulate – passed on from her grandmother – Its about different types of wood and how they burn. A short film that documents the horse drawn arrival of Energy Cafe on Powerstock Common, Dorset. Shot and edited by John and Sue Holman. Karl Edwards decided to take up a new career working with horses. 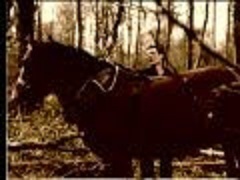 He trained his horses Bonnie and Alf to work in the woods with him and also began training as a farrier. Catherine Simmonds recorded interviews with Karl and also the intricate sounds of his daily work. Catherine wrote and recorded poems that were inspired by her time with Karl. Johannes Van Weizsacker of The Chap provided original music. This montage of sound was then put together by Catherine working with John Holman at Transition Vision’s base in Wincanton. I was reminded that this piece was sitting on the shelf when I encountered Karl and his horses at a Spring Procession on Powerstock Common. They had been pressed into service to tow the mobile Energy Cafe to its location from where it was going to be in operation for a week providing food sourced from within a 6 mile radius and cooked and prepared totally off-grid, using a wood fired range and various portable reusable energy devices. This audio piece was produced as part of an Arts Council Funded Trilith project.